Rebecca Pierce is an independent journalist and filmmaker. Her work has appeared in Alternet and Mondoweiss. 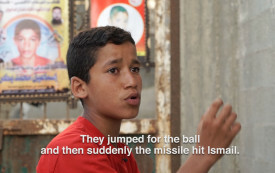 Four boys of the Bakr family were killed by a missile strike during last year’s incursion. Their surviving family members are still scarred from the attack.